JohnFKennedy is a Legacy Library. Legacy libraries are the personal libraries of famous readers, entered by LibraryThing members from the Legacy Libraries group. » John Fitzgerald Kennedy's catalog. » John Fitzgerald Kennedy's legacy profile. JohnFKennedy is also an author. 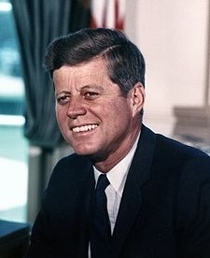 » See John F. Kennedy's author page. About my libraryThe current (6/2008) inventories of JFK's books are not good. The information is thin. Only a small number of books have anything more than the title listed. The most detailed list is called "Not Comprehensive". I did not tag those books, as the locations of these books are unknown to me. They may all be at the John F. Kennedy Presidential Library and Museum, but that information could not be found on their website. At the bottom of the Not Comprehensive list is a link to "Books at 122 Bowdoin Street". I tagged the books "122 Bowdoin Street" from that list. Not many books from Bowdoin St. could be positively identified, as they are only titles. I was careful to add editions which made the most sense. Like, pre-1963, and if a book had a printing of 1937 and 1944, I'd choose 1937, as JFK likely wasn't buying a lot of books in 1944. I also generally, all other things being equal, chose Boston printings over New York. I could be wrong, but it's what I have to go on. I'd also choose the trade hardback, not reprint editions, like Grosset & Dunlap, or paperbacks. There were very few of these which were even possibilities. One interesting thing, he had several books related to Life Insurance. Also, a bit more Communist/ Left stuff than I anticipated. What remains to be entered now are mostly official reports of different sorts. Some of the titles are too vague, or the year is omitted, and a year is needed to determine which report it is. There are also a few titles which are too vague to deduce which is intended. I remove titles as they are found and entered.